I know it's a little late for a March sale, but David Legrand at Fraser Yachts tells me he found a buyer for the 30.2m motor yacht New Star last month with no other broker involved. 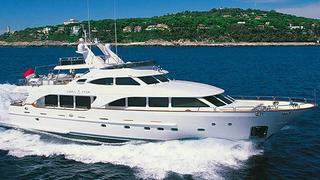 Built by Benetti in 2003 to ABS class and designed by Stefano Righini, she was refitted in 2008. MCA compliant, New Star accommodates eight guests in a master suite, VIP stateroom and two twin cabins while twin 1350hp MTU engines power her to a cruising speed of 12 knots. New Star was asking €4.3 million.